ONE+: Super-light cross-country hardtail that fits up to 3" tires for the roughest terrain. U.P. & U.P.P.E.R. 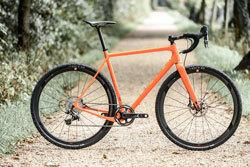 (superlight): GravelPlus frame that fits road, cross and mountain bike tires. Go anywhere fast! At OPEN, our motto is “working hard to stay small”. We’ve done the “big company” thing, and it was time for something different. So we design the bike we want to ride ourselves, we produce them, sell them to like-minded people and that’s it. Staying small forces us to focus on what matters: Product development, taking care of customers (shops and consumers), and not much else. No sponsorships, no marketing, no complete bikes, no flashy offices or employees; we simply don’t have the time for any of that. So if the simplicity of nice bikes, nice rides, nice company and nothing else are what you’re after too, join us at OPEN. One way we're staying in touch with our customers: our annual CrossFondue. As Winter draws to a close, we gather for a beautiful ride through the forests around Basel. And along the way, we stop at a little chalet for a traditional Swiss cheese fondue. Anybody is welcome, customers, future customers, retailers, media and industry friends. The atmosphere is relaxed, we split in a few groups based on ability (Andy in a fast group, Gerard in a slow group ;-) and we adjust the route so that everybody sits down for the fondue together. We hope to see you there next time! For more on the CrossFondue, see the video and photos. Cycling was always in my life but it was more a means of transportation to school and around town rather than really something I was interested in as a sports tool. What brought me into the sport of cycling and into the cycling business was literally an accident (or better two). I was obsessed about volleyball but when I was 18 years old I had several injuries that forced me to stop playing. And that’s how I got into mountain bike racing. A few years later, I was studying at university and needed money. 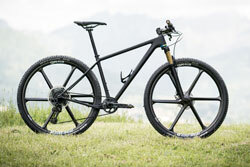 Looking for a job, I saw an ad from Cannondale Switzerland looking for a full-time secretary. As I was racing on a Cannondale and I loved the brand, I called them to say that I am not a secretary and that I cannot work full-time but I would love to work for them. Soon I started to work for them as a part-time secretary. As the business was growing rapidly we hired finally a real secretary and I started to work as a sales rep. When I finished my studies, I moved to the Netherlands to work full-time for Cannondale Europe. After that I worked for Scott Europe for four years, in both sales and marketing positions. But on the other hand I could build up a brand from scratch with all the freedom that I needed. After seven years of growing BMC from a small Swiss company to an international player, I started to realize that it was slowly becoming more like a job for me rather than a mission. It became political, administrative and slow… I had to make a cut and let my baby go. It was a year full of changes both in business and my private life, which back then was quite tough. Looking at it right now, it was one of the best years in my life. I learned more about myself and where I wanted to go than in all the rest of my life. After just riding my bike for a couple of months in a couple of exotic places in this world I started to work for Cervélo as their international sales director and that’s how I met Gerard. After four years at Cervélo, I just felt that personally I had to make a change again. I decided to leave the company not really knowing what I wanted to do next. I worked on some projects for other bike companies when one day my “former boss” Gerard called me up and told me about his little new project. I still had this dream of building up my own company one day. Gerard is somebody I have great respect for. We have completely different skill sets and that’s what fascinated me most about doing something together. I think we have an ideal combination of knowledge and network. We are both very passionate about what we do and cycling is an integral part of our lives. With OPEN we can realize our visions without any of the compromises we had in our previous adventures. As a kid growing up in the Netherlands, riding a bike was a given. As we lived on the edge of the Dutch Grand Prix motocross track, we would spend countless hours riding there and fixing up our bikes (somehow kid’s bikes and city bikes don’t do well on jumps). When I was 14, the whole family went to an alternative lifestyle/renewable energy event. Most of it was about growing your own carrots and building windmills, but there was also a display from the Dutch Human Powered Vehicle Association. I loved these rockets that could go so much faster than normal bikes and I met Mike Burrows (big HPV guy and later also the designer of the Lotus superbike). So I moved away from normal bikes and concentrated instead on HPVs. At 18, I built my first HPV (from an existing design). Later that year we built what is still the world’s lowest (and quite possibly most dangerous) HPV with three friends. We even participated in the 200m sprint at the European HPV Championships that year. Deciding who of us three would ride was easy; only one of us had the balls to ride that death trap. He finished 11th, not bad considering he didn’t pedal the last half of the distance as he was too busy struggling to keep the bike upright. In 1993 I organized a symposium and a contest for the "365-days-a-year bike". We got some coverage on CNN and I met Chet Kyle, who was the founder of the International HPV Association but also the designer of the 1988 and 1996 US Olympic bikes. Chet was amazing and the designs so cool that it rekindled my interest for UCI legal bikes. It also sparked my mechanical engineering graduation project, the design of an aerodynamic time trial bicycle (the Baracchi “green machine”). Which in turn led to the creation of Cervélo, where Phil White and I spent the better part of the next 15 years pushing bike design as far as we could. In 2011, Cervélo’s achievements had gone way past my wildest dreams, but it had gotten too big for my liking. So after a lot of soul-searching, I left. After a bit more, Andy and I started OPEN. I have never regretted it for a moment. If you have any questions for us, please contact us using the below form and we’ll get back to you as soon as we can. Please keep in mind we’re a 2-man company, so sometimes we’re able to respond quickly, sometimes it takes a bit more time. please select who e-mail to. Question received, we will contact you shortly. For any issues with this website or with registering your OPEN online, contact our webmaster Matt. Copyright © 2019 OPEN cycle AG.